We said Bays by 4 and were close. Westshore went out early to a 10-0 lead with the infamous slope at MacDonald Park to their advantage. The Bays stormed back in the second half and led 21-10 going into the last 10 minutes. Westshore clawed one back for the bonus point loss. Connor Braid was a standout for the Bays and #8 Ben Brill was Westshore's impact player. Jake Thiel playing #8 scored one of the second half tries for the Bays. Next week the Bays travel to Seattle while Westshore celebrate their 50th by hosting the Rowers. This looks interesting, James Bay with Connor Braid back in the mix after putting in a guest appearance last week with the Ravens at the CRCC. They've also added the Thiel brothers with Josh getting the start at #10 and Jake at #8, Matt Mullins at #6. It's a good looking roster. Westshore not to be outdone have young Quinn Ngawati back from the Toronto Wolfpack and starting at outside centre. He's teamed up with kiwi Taylor McGuire so both sides have plenty of talent through the centres. Nakai Penny is on the bench for Westshore and he also played well for the Ravens in their CRCC win, he won Best Forward award at the tournament. Look for him to have an impact in the second half. Should be a cracker. Giving JBAA the edge on home field advantage. Prediction: JBAA by 4. We keep underestimating the T-Birds after their week 1 loss to the Rowers. We thought the Ravens were the team this year with the addition of key players but it seems they have a way to go yet. These teams may still meet in post season to decide the title as they did last season but UBC currently sit top of the standings and will be difficult to unseat. Next week is the epic UBC v UVic match, round one at UVic. These teams are eyeing the National University Championship coming up next month, also at UVic, so this will be a huge match to set the tone. The Ravens travel to the Island to take on the undefeated CW side, it's going to be another tough match for the defending Premier champions and current Canadian Club Champions. This is a rematch of last year's championship final, it should be a good one. The Ravens are looking like a team ready for the repeat, as the T-Birds did in the previous years. 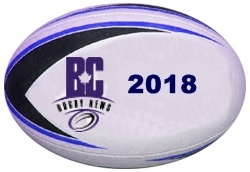 The Ravens coming off a comprehensive win at the Canadian Rugby Club Championships will be full of confidence. Their backline featuring Aaron McLelland and Sean Ferguson are full of creative flair on the counter attack. Graham Turner impressed at the CRCC scoring a bucket load of tries from the wing. Jorden Sandover-Best at scrum half is getting better as he matures. Conor Finn in the centres is a former Ireland U20 player (2012). The only question mark is around the forwards but they've added Wolf Pack standout Grant Crowell to the #8 role. He was perhaps the standout player at the CRC's this summer. The front row had some trouble against the Harlequins at the CRCC but managed to hold their own by the end of the match. The T-Birds have Ben Lesage and Andrew Coe in the lineup, both Canada level players. It should be an interesting match and possibly a preview of this year's final as well. Prediction: Ravens by 5. Another one we got wrong this week, not a stellar prediction weekend. The teams were tied at the half and Caps went ahead 15-10 on a try by Chris Robinson but it was all Burnaby to finish the match as they kicked 3 penalties and added a converted try. Both teams have byes next week. Two teams tied in the standings with 2-1 records and 10 pts. Burnaby difficult to figure out this year, one week spanked by Ravens, next week they defeat a good UVic side. Caps perhaps more consistent only losing to a CW side stacked with national team 7s players, and on the road. Burnaby missing the addition of Admir Cejvanovic this week. It's almost too close to call but Caps at home hosting a fundraiser for Breast Cancer research get a slight nod. Prediction: Caps by 3. A strange match as Seattle tweeted "Second half 74 mins and Sarries Premier ahead by 40 to Rowers 22" and it looked like it was a done deal. What happened in those final 6 minutes is match report worthy so hopefully one of the Rowers will put down the paddle for a minute to pick up the pen and let the rugby community know the final minute heroics. The Rowers are 2-1-1 and middle of the pack in the standings, not bad for a team returning to Premier. Seattle drop to 2-3 and are one of two teams to have played 5 matches so far this season. Next week Rowers travel to the Island to take on Westshore while Seattle host James Bay. Rowers were down 40 points to 22 in the 74th minute, both teams with 14 men on the field. The pack rolled in 2 tries, then the backs put one over in the corner in the 83rd minute. A Brian Derham sideline conversion for the Rowers win, 41-40. No roster from VRC, they tied Nanaimo last match out at home so they'll have difficulty claiming the win on the road against a strong Seattle side. Seattle have added Roland at centre from the Suniula clan and he'll team up with brother Shalom who directs the team from flyhalf. Roland played for the Austin Elite of the MLR last year and his appearance here would seem to indicate he'll sign with Seattle Seawolves this year. There are a couple of other Seawolves players in the roster, Kellen Gordon and Dion Crowder. Seattle always tough at home have already faced the two strongest teams from last year, defeating Ravens and narrowly losing to the T-Birds at home. Prediction: Seattle by 10. Not the result the Hornets would have wanted after a positive draw with Rowers last match. UVic looking strong as they prepare for UBC next week and the University championships next month. Ollie Nott scored 4 tries, Isaac Kaay a couple more and it sounds like the tries were coming fast and furious for the Vikes. Nanaimo's defence certainly needs some attention from their new Irish coach. Next week UVic host UBC and Nanaimo host Meraloma. Nanaimo keep adding to their import list to make the team more competitive in the BC Premier. They tied Rowers last weekend after adding Scottish flyhalf, Gillies and southern hemispere player, Tumua Uluilelata. There's a couple of new names this week and with Jared Stephens, their top scorer from last year, set to return next week they look ready to be competitive after a slow start. This match doesn't count towards the Premier standings but is a Barnard Cup match, an Island competiton among Premier sides. UVic have a strong lineup which includes Isaac Kaay who played with CW before the Thanksgiving break. It's unlikely a time sharing program between CW and UVic - the 7s player is studying at UVic and eligible to play for them. Nanaimo might be wondering if Kaay enjoys the trips up north as they faced him a few weeks ago in a different jersey. It's a strong UVic backline with Grady Bowd orchestrating from #10 and Crosby Stewart finding his form at #9. It will be a good test for the new look Nanaimo squad. Prediction: UVic by 8.